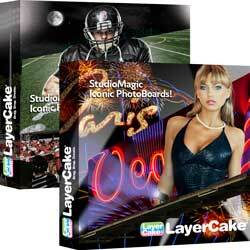 Introducing LayerCake’s new Billboards & Marquees. you can make Absolute Magic! Creating amazing composites no longer requires being a Photoshop Zen Master or understanding the mind numbing process of making cutouts. We do all the work for you, creating eye popping fully assembled studios that you can customize with your eyes closed! • Bonus accent layers, like spot lights, birds, trees, moon etc. • Themes include: Sports, Children’s, Hollywood, Las Vegas, Rt. 66, Beach, Amusement parks, Urban Cityscapes, Highway & Cars, Fun, Edgy & Cool. No More Costly Location Shoots. Just drag & drop people into exotic locations with NEW StudioMagic PictureWindows!